Fashion suits aren't fashion suits unless they have the EJ Samuel label inside. These cutting edge high fashion suits are always made to get you noticed with their unique styles and cutting edge fabrics. 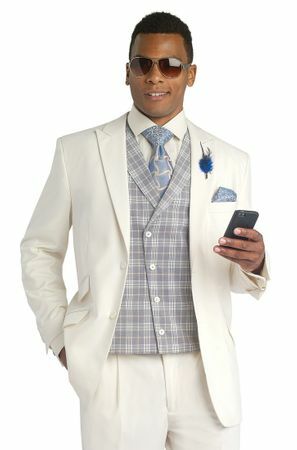 This cream and fancy plaid vested suit is typical of what fashion suits by EJ Samuel are all about. The jacket features side vents and has pleated pants. Made of super 150s poly/rayon.